How to use extra options and attribute swatches with Simple Products? 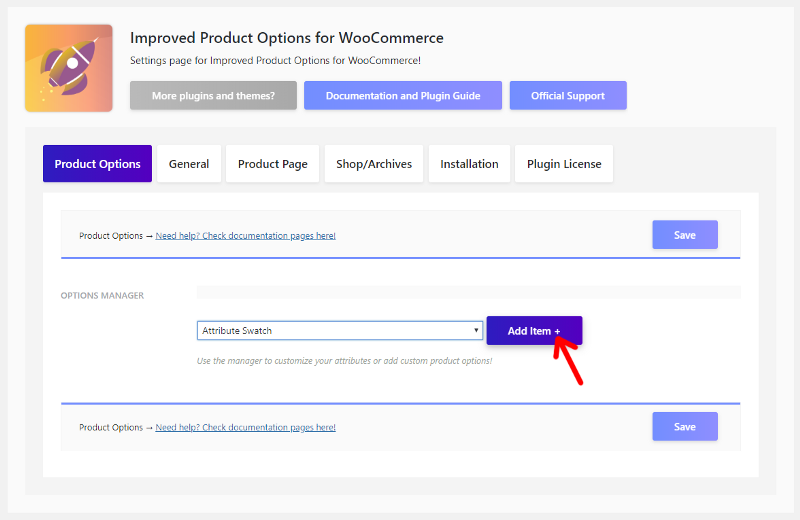 At first, we need to configure the Improved Product Options for WooCommerce plugin to work with simple product. 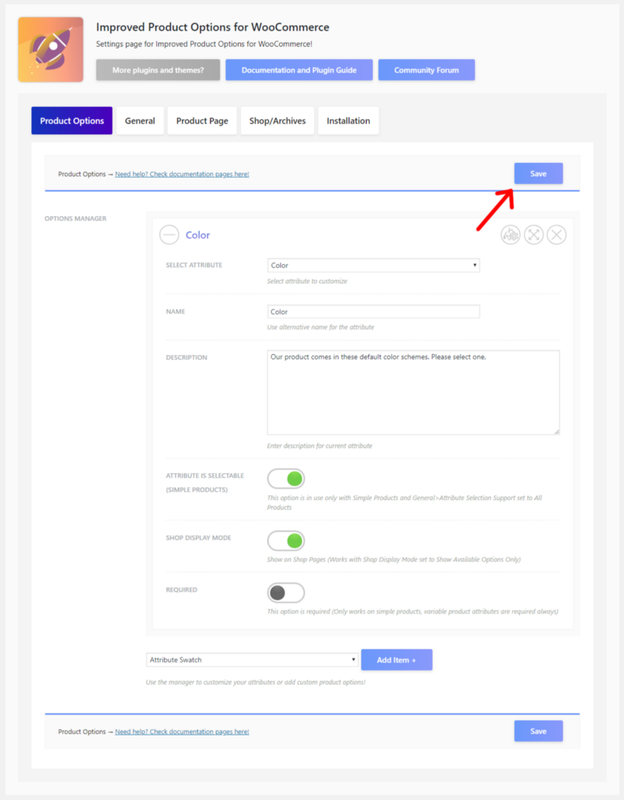 Navigate to WooCommerce>Settings>Improved Options and click the General tab. 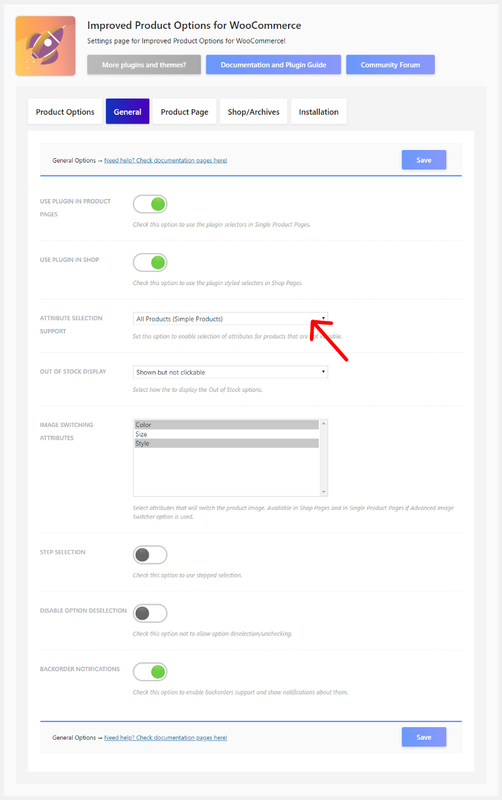 Set the Attribute Selection Support option to All Products (Simple Products). Set Attribute Selection Support to All Products! Once this option is set, our simple products are ready to go! We can set attribute swatches and extra product options! To do this, follow these steps. 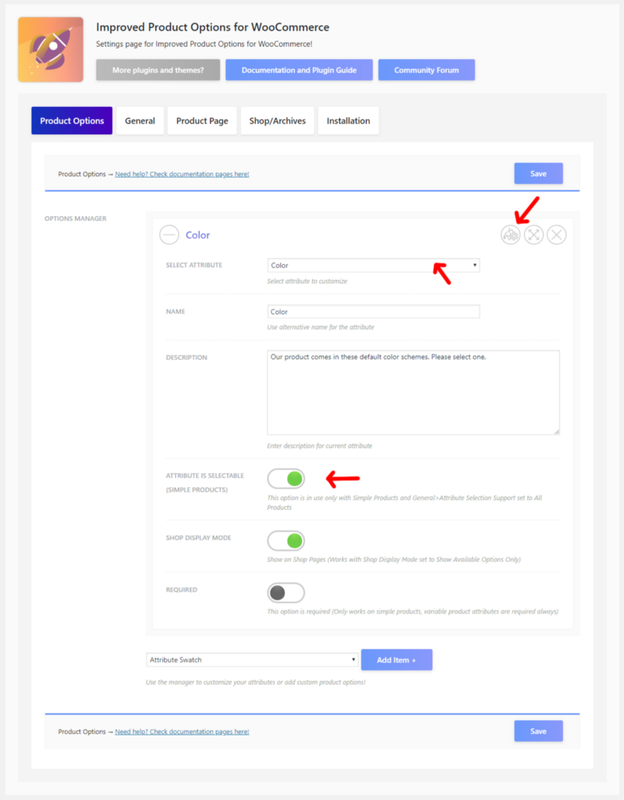 Make sure the option WooCommerce>Settings>Improved Options>General>Attribute Selection Support is set to All Products (Simple Products). Click the Product Options tab. Choose Attribute Swatch then click the Add Item + button. Select attribute Color that you’ve already made and that you’ve used in simple products. Make sure the option Attribute Is Selectable (Simple Products) is set to ON. If Attribute Is Selectable (Simple Products) options is set to OFF an attribute will not be used for selection in simple products. Click the Paint/Cog icon and Terms Manager will appear. All done! Let’s see how that looks! See how easy that was. Couple of clicks and we’ve made our simple product attribute selectable and even styled those into color swatch options! These attributes are styled globally, so any simple product that has these attached will get the swatches in product pages. Let’s see how that looks. WooCommerce Simple Product with active and set Improved Product Options plugin. Further we can set thumbnails, buttons even HTML custom swatches for any simple product attribute. Explore the options and you’ll have a wonderful set of swatches for WooCommerce simple products too! Take a note that simple products don’t provide stock support, backorder notification, image switching and similar functions. If you want these features, you will need to use WooCommerce Variable Products. Need more info on Improved Product Options for WooCommerce and Variable Products use? 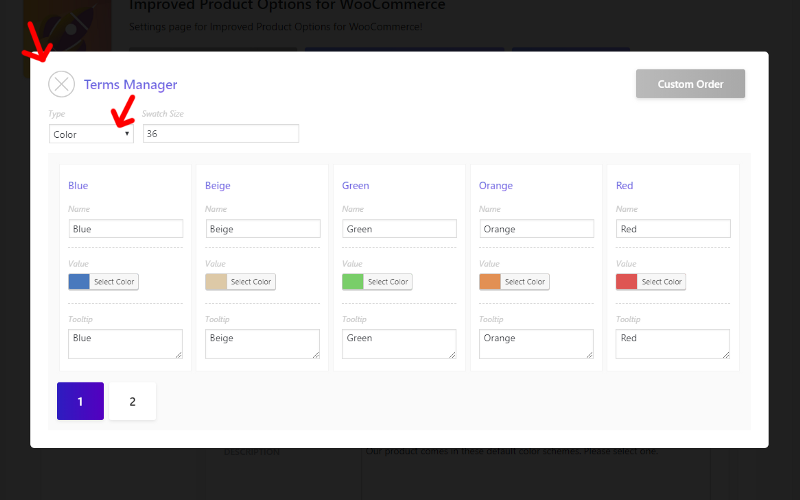 Navigate here → “How to create great looking color swatches for your WooCommerce Variable Products?”. 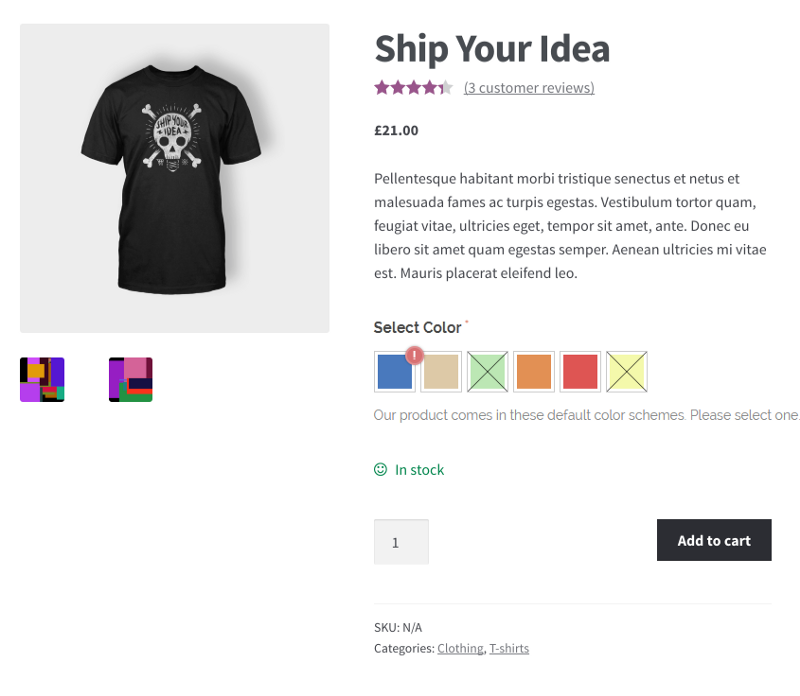 ← Previous Previous post: How to create great looking color swatches for your WooCommerce Variable Products? Next → Next post: How to create a Color Filter for your WooCommerce shop with swatches and everything?